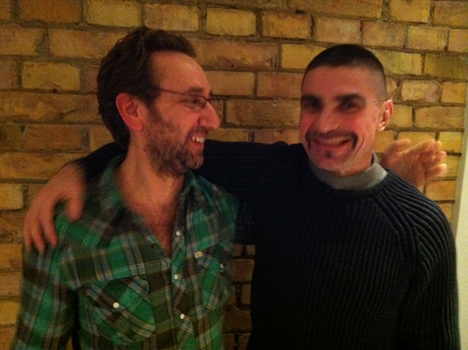 Julian Rubinstein and Attila Ambrus in Budapest, Feb 1, 2012, the day after Attila's release from prison. 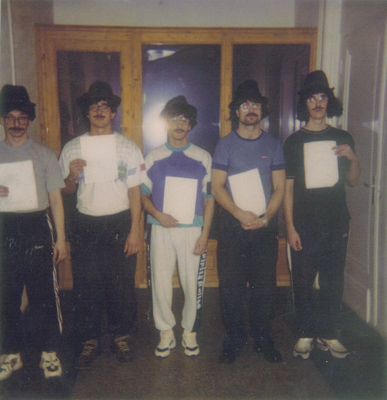 Six days after Attila and his accomplice (and hockey teammate) Gabi were arrested, they were dressed in dimestore wigs and fake mustaches for a police lineup at the Budapest City jail, January 21, 1999. Attila is second from right; Gabi is second from left. 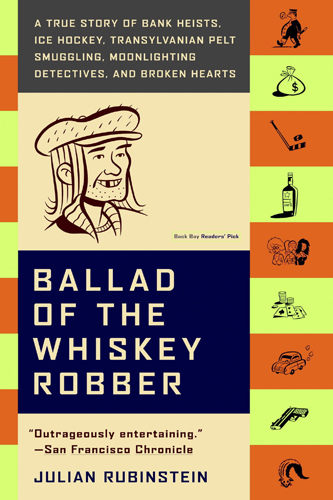 Two of the other men in the lineup are the Szucs brothers who had been in jail almost a year on charges of having committed several of the Whiskey Robber heists. 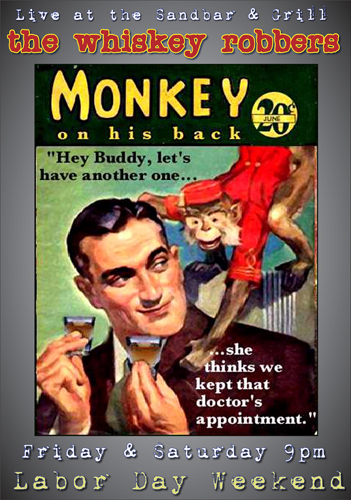 None of the witnesses at this lineup fingered the real perpetrators, Attila and Gabi. 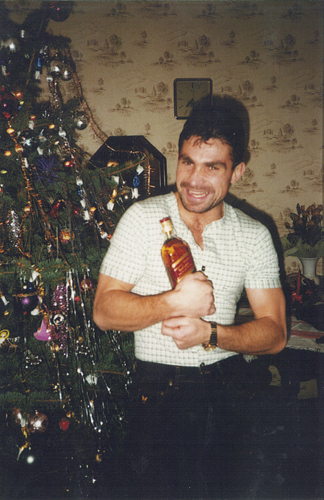 At Christmas in the mid-1990s, Attila gets a present he likes: his signature spirit, Johnnie Walker Red. 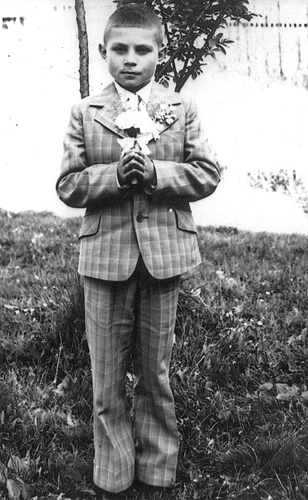 Attila as a child in Fitod, Transylvania. His mother left the family and his father beat him. He was raised by his grandmother and escaped Romania into Hungary underneath a train. 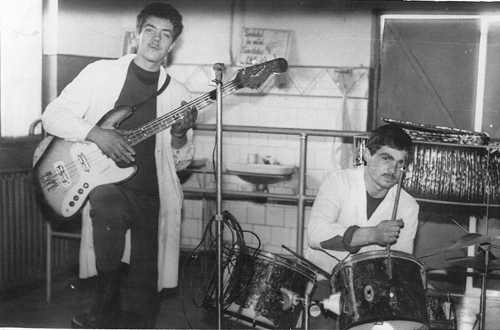 Attila, on the drums, in his high school band. 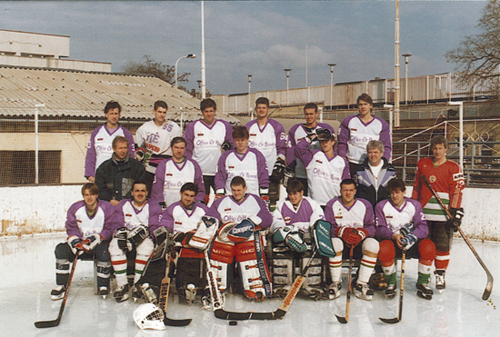 UTE team photo,1994-95 season, Attila's first as the regular goalie. He had previously been the team's Zamboni driver, making the rare leap up the depth chart. 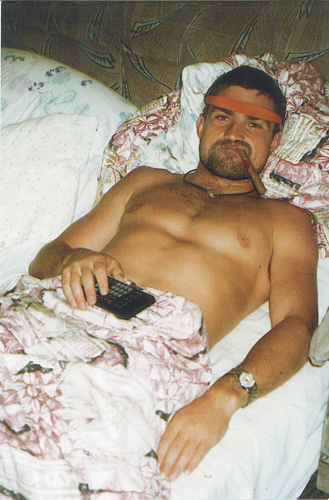 Attila led the team to two season without a single victory, including this one. Attila is in the front row, third from left. His robbery accomplice, Gabor Orban, is top row second from right. 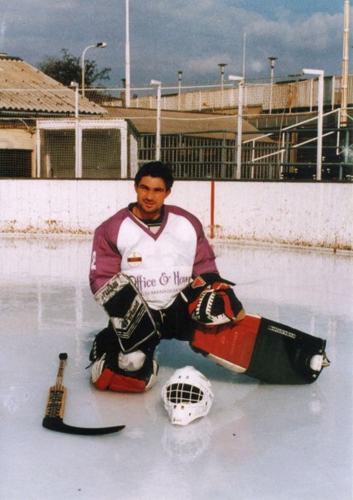 Arguably the worst goalie ever to play professional hockey, Attila once gave up 23 goals in a single game. Even as the Zamboni driver, he had problems, once miscalculating a turn and crashing the machine through the boards. 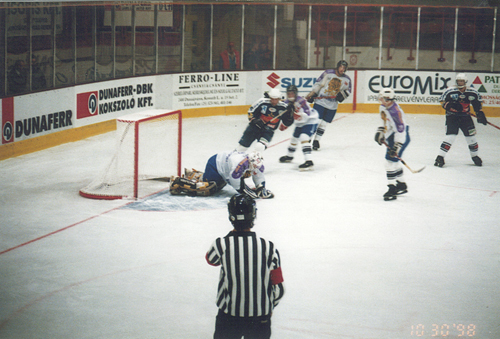 Attila, in goal, covers the puck. 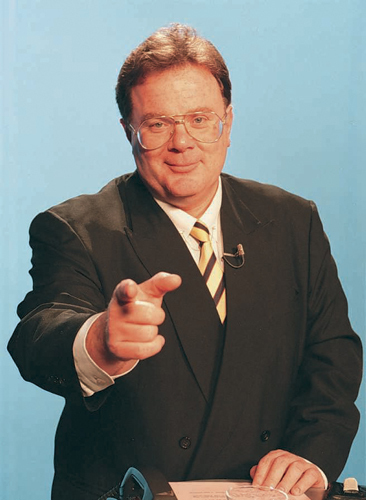 Host of the hit Hungarian crime show, Kriminalis, which followed the Whiskey Robber case for years. 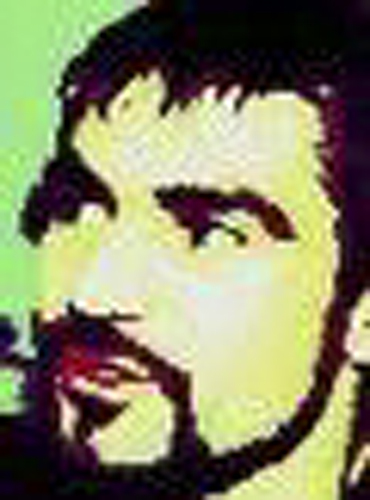 When the show changed nights in the lineup, Juszt broadcast a message to Attila to change his robberies from Tuesdays to Thursdays. Attila obliged. 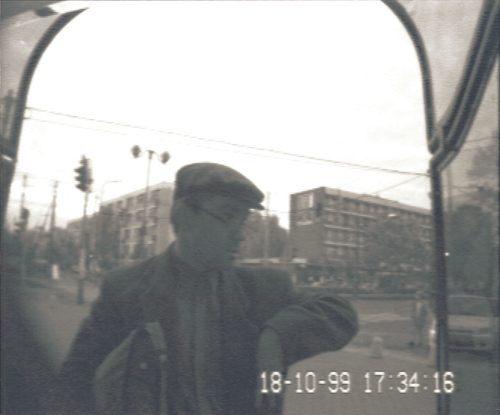 Attila in disguise robbing the OTP Bank on Grassalkovich Street in Budapest. He robbed this same bank four times. 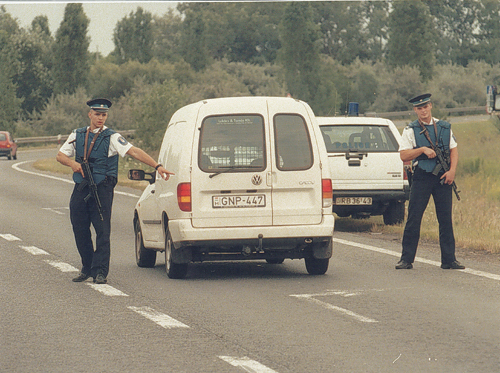 After the main robbery chief resigned, Josef Kesthelyi made headlines by capturing the Whiskey Robber trying to escape over the Hungarian Romanian border on January 15, 1999. One of Attila's many female fans holding his photo. 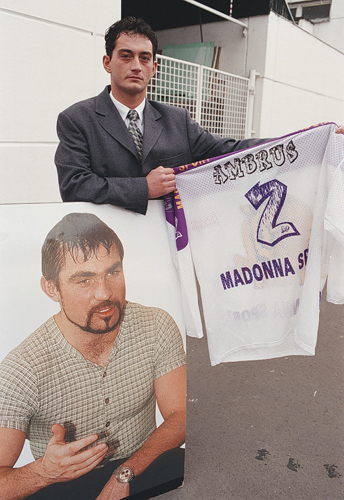 After his arrest, Attila's jerseys and Whiskey Robber mugs and T-shirts went on sale around the city. 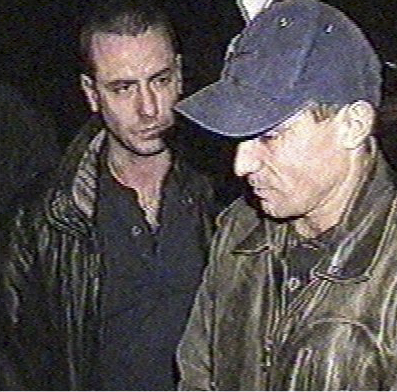 Former robbery chief Lajos Varju meets Attila for the first time at the jail. For almost six years, Lajos unsuccessfully chased Attila, finally resigning from the force in despair. 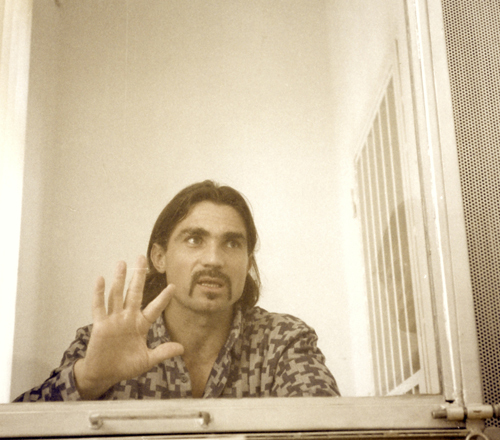 Attila told Lajos that day that he was going to escape from the jail. And the following month, he did. 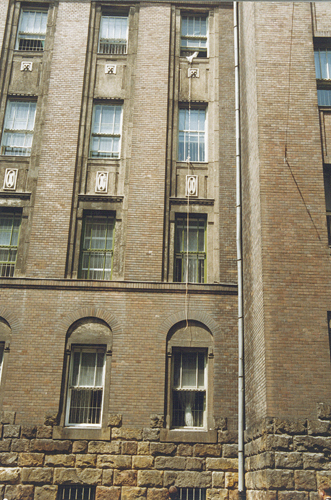 The view from the street looking up at the fourth floor window of the Budapest jail building out of which Attila escaped on a rope made of bedsheets, towels and shoelaces. The rope ended 17 feet above the ground. Attila badly injured himself when he hit the ground but was able to get away. 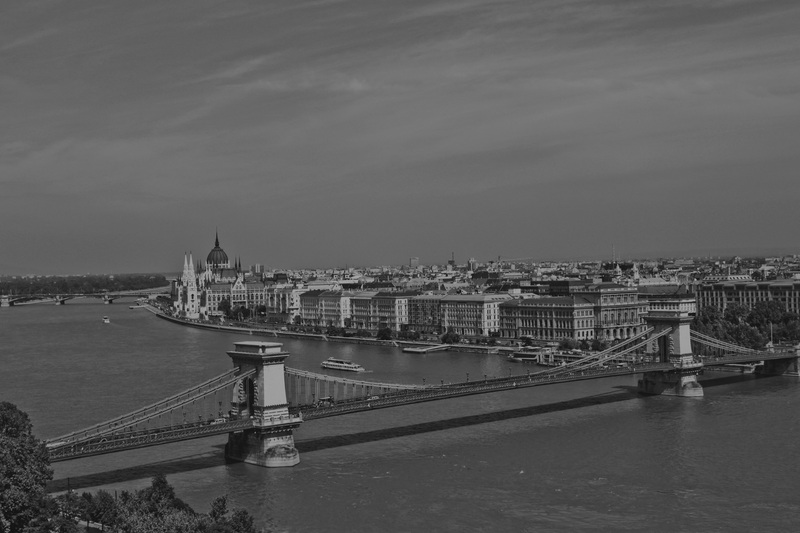 The day Attila escaped from jail, Hungarian authorities sealed the city of Budapest. All cars leaving town were searched. 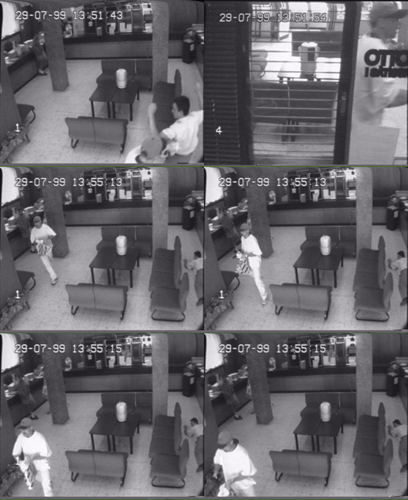 A bank surveillance camera captures Attila entering the OTP Bank on Ulloi Street in Budapest, his 29th, and final robbery. October 18, 1999. 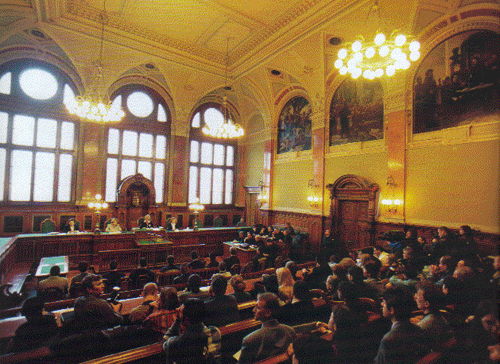 The Hungarian Supreme Court Building was standing room only for the day of Attila's sentencing, December 14, 2000. "One less small fish," read one headline the following day. 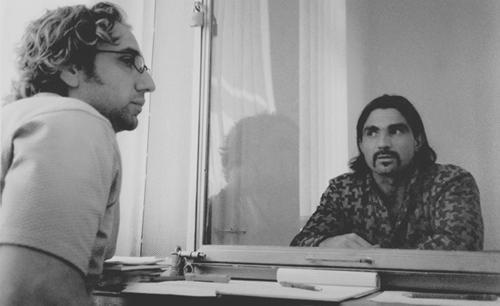 Julian Rubinstein and interpreter interviewing Attila during a break in his trial at the Hungarian Supreme Court Building. 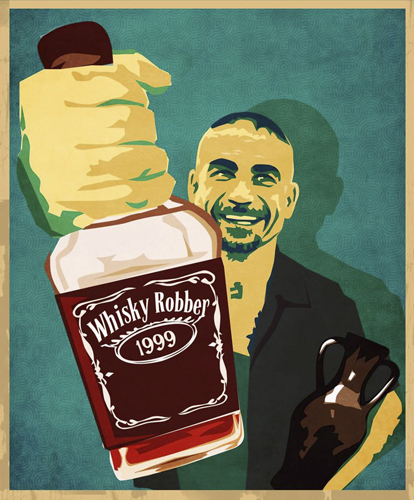 After Attila was re-captured, Whiskey Robber supporters memorialized the number of his robberies vs. the number of his arrests, using the sports score format. This graffiti was sprayed on the wall of the Budapest apartment building in which Attila hid while on the lam while the largest manhunt in post-communist history was carried out around him. 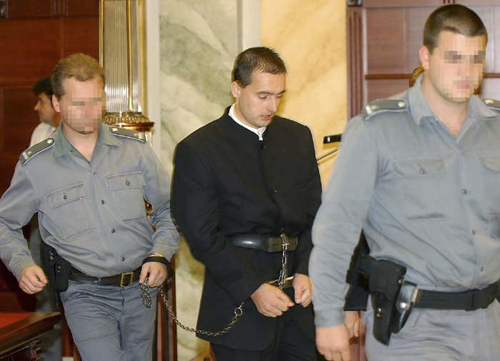 Attila's hockey teammate and robbery accomplice, Gabor "Gabi" Orban, in handcuffs, being led into the courtroom during the trial, which began in summer of 2000. After he was recaptured, Attila grew a Rasputinesque beard to protest what he said was the inhumane treatment he was receiving in jail. 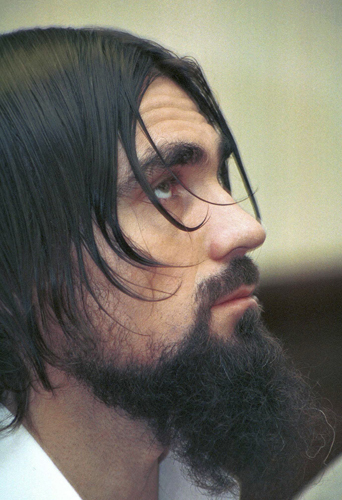 "I am treated like a terrorist so I don't want to disillusion my captors," he said. A rendition of Attila from a Hungarian Fan page.